Into the jungle. Into the wild. Into harm's way. When he was a boy, Luc's mother would warn him about the "mock men" living in the trees by their home -- chimpanzees whose cries would fill the night. Luc is older now, his mother gone. He lives in a house of mistreated orphans, barely getting by. Then a man calling himself Prof comes to town with a mysterious mission. When Luc tries to rob him, the man isn't mad. Instead, he offers Luc a job. Together, Luc and Prof head into the rough, dangerous jungle in order to study the elusive chimpanzees. There, Luc finally finds a new family -- and must act when that family comes under attack. I'll be honest: I don't love the cover. I wish it was something more like Endangered's original hardcover. That said, I will still so totally read and buy this book. It's not non-fiction, but it's YA fiction that reads realistic. And it is SO GOOD. I highly recommend you read both! This is the first I've heard of this one. Sounds good, though. I agree with you on the cover, too. Eek. 2014 is so close! Makes me wonder where the year went. This book looks interesting. I love realistic fiction - when it's not quite right but feels so true that you believe it entirely. This looks like a great one! i haven't heard of this book and it's not my typical read (actually threatened is unlike anything i've read in recent memory) but i like the sounds of it! adding it to my goodreads list. This isn't really my kind of book, but I agree with you on the cover for sure. The cover looks cartoonish to me. This does sound really good! And I agree, the cover is kind of boring. But the story seems right up my alley, I love animals too:) Great choice. I think that these both sound really cool! Yeah...I'm not a fan of the cover either! But the summary sounds good! I also don't love the cover. Not quite photoshopped enough to be realistic, but the summary is quite unique! Thank you for sharing an unexpected WoW book! Very interesting! 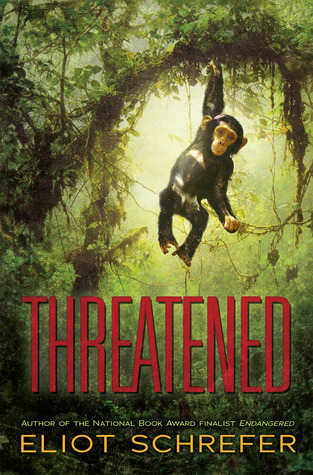 I love the cover of Endangered this one I am not to sure about! I have not read a fiction book about primates ever, so I may have to change that soon. Thanks for sharing and for stopping by my blog! Nice pick! This was new for me! Hmmm. I don't think of heard of this one or the author, but it sounds intriguing. I'll have to check it out. Great pick! Oh, I'm with you. The cover is not wonderful, but the book itself sounds awesome! I've never heard of it or the author, but I'll definitely be reading this or his older book. Great pick!! Sounds good. I haven't seen it before but I'd love to check it out. Great pick! This is a new one to me so thank you for bringing it to my attention!